See below for the original plays that we offer. A 1930's Comedy Whodunnit in 3 acts. Writer Robert Lawrence and his wife Barbara are throwing a party in their smart apartment in London's west end,their guests are a mixed bag of acquaintances; none of which BOTH of them like! They are; old 'friends' Major Powes-Staunton, and his apparently downtrodden second wife Peggy, who, in order to blur the edges of an unfulfilled life drinks too much; much to the irritation of the Major, and the sometimes embarrassment of their circle of friends. Barbara's indulged little brother Hughie Carr has been invited, and as his date brings Francine Hall; a nightclub entertainer with a reputation for the high life, unfortunately for Robert, he did not know of Hughie and Francine's relationship and when it transpires that he himself has shared a few 'dates' with her; while Barbara was away visiting relatives there is quite a problem! New residents of the apartment block are a Mrs Wilkes and her plain daughter Alice, who Barbara has only invited because Barbara felt sorry for them. Completing the guest list is Billy De-Vine a sometime actor and full time socialite, and Tim Mitchell, the pianist from "Murrays" Nightclub; all of whom have their own skeletons in the cupboard! Act 2 comprises of songs from the period performed by some of the more 'outgoing' guests; much to the chagrin of the temperamental housekeeper Mrs Walker. 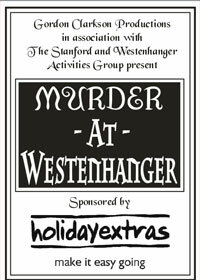 This sets the scene for a "Party to Murder" where one of the guests will be murdered; and it transpires that most of the guests have a motive! A Comedy Whodunnit in 2 acts; set in the present. 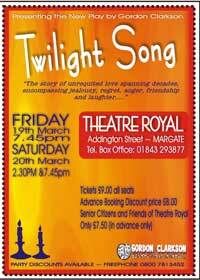 A Lottery winner uses his fortune to attempt to re-create a season of Repertory in a run down seaside theatre. He has assembled a motley crew of actors, some 'seasoned' pros, and other 'raw' beginners; all with their own insecurities that unfold as rehearsals take place for the next week's production "Murder on the Farm". "C.J." who is never seen; his instructions are passed on to the the actors via the "Artistic Director" Helen "Tiggy" Winston, and the unfortunate and put upon Wardrobe Mistress/Box Office Clerk/Stage Manager/Usherette/Ice Cream Seller and cleaner; Liz White. The actors comprise of; Augustus Trimble; an actor of the old school, who finds it difficult to remember his lines, and sometimes even stay awake, who has only got the job because he and Helen shared a "Rep romance in Bournemouth in 1957! Fran Harris; his exact opposite, is a "Method Actress" fresh from drama school, Darren "Daz" Stevens, the young acting ASM who dreams only of Hollywood success and is doing this job very much on sufferance! The leading lady is Edna Fairbrass; a 'mature' actress who has an inflated idea of her status; both in the business in general, and in this rep company in particular! Stephanie Williams is her nemesis; having been brought in to take the lead in "Murder on the Farm" and subsequently to replace Edna completely! Stephanie is the only actor who has actually seen "C.J." having been given the job after a one to one 'audtion' over the course of a weekend in Brighton. The acting company is completed by Charlie Hyams, a comic actor who supplements his income by being "Uncle Charlie" at the local holiday centre on Thursday afternoons, and working at the wet fish shop on the High Street on Saturday mornings. Their egos, and the claustrophobic backstage atmosphere combine to make a recipe for murder! "DR JEKKYL AND MR HYDE - TOGETHER AGAIN"
new musical based on the classic story! 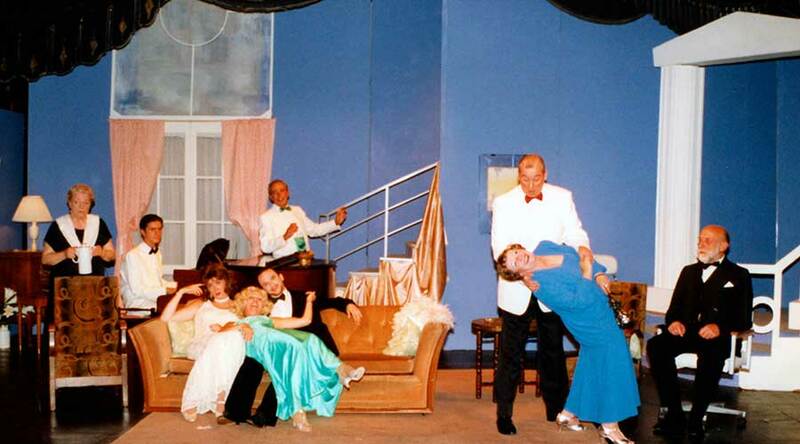 Everything goes wrong, including the musicians refusing to turn up due to a dispute about rates, but instead of cancelling the opening night, the group decide to try to stage it as a play with disastrous and hilarious results! A a group of friends trespass into the ruins of Westenhangar Castle near Hythe in Kent to celebrate the summer solstice, unaware that it was the medieval home of "The Fair Rosamund" - mistress to King Henry II. The boys disturb a tramp who is trying to sleep in the only part of the castle still barely habitable; "Rosamund's Tower" which leads to an altercation. Suddenly, one of the girls becomes unwell and starts to act oddly. 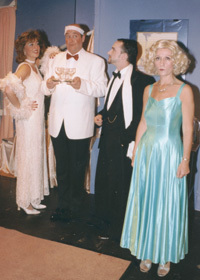 The play begins in "Rose Nicholls new bedroom in "SUNNYFIELDS" Residential Home for the elderly on 19th February 2004. Action also takes place in "The Quiet Lounge" at "Sunnyfields" and the front room of Rose's house; 92 Tavistock Road, Swanley, Kent. In act two, the locations are the same, but we see 92 Tavistock Road in the past at different dates from 1966. The play explores a situation in which an elderly lady has to be placed in a residential home, and we see it though her eyes, and those of her family, who in addition to suffering the usual guilt at their relative going into care, have to clear her house. Rose does not appear to have thrown anything away for a number of years, and some secrets are unveiled as Rose's daughter Sue and her Grandson Gary begin the unenviable task! Sue has always had a rather strained relationship with her Mum, and an absent daughter, Ann seems to be Rose's favourite. This injustice is emphasised as Ann's actions over many years become evident! The other regular residents of "The Quiet Lounge" at "Sunnyfields" have to make adjustments for the new addition to their home, and Maisie Goring and Sylvia Crint have their own stories to tell. We see two members of the "Sunnyfields" staff; Mary Seldon, the senior carer, who is training young 18 year old Jenny Mills in the underpaid and demanding career of being a care assistant. As the story develops we discover secrets and disapointments Rose has carried with her and towards the end, both Rose and Sue appreciate qualities in each other that had not been evident previously. All this and more... is the story of "Twilight Song"
This piece tells the story (with Music Hall music and songs of the period) of the formation of a fictional "Concert Party" troupe around the turn of the century. 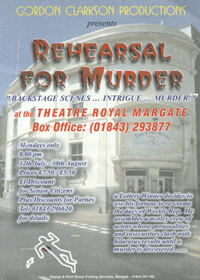 The action takes place in various theatres, Music Halls, Concert Party "pitches" and dressing rooms etc. in London, Bournemouth, and Broadstairs in the late spring into summer 1899. It begins in a small music hall in Catford, where Jack Gold and Harry Miles have been stranded without any work or money; they decide to go 'up West' to busk to the theatre queues; after all...they have "Nothing to Lose"! There they meet Dora Maye, who is also working to to the queues. After a rather uncomfortable meeting, they decide to team up, and their act takes them to the Vauxhall Gardens, where they meet Conjurer Wal Burgiss, and as the story developes subsequently complete the team with soubrette Daisy Lindon, and soprano Blanche Kirkby; all of whom, for various reasons, have "Nothing to Lose". They head off to Bournmouth to set up a concert party pitch on he beach, and things go well, until through various situations akin to the human condition, have to split up. Wal and Harry go their separate ways, while the ladies and Jack get a chance to work in the "Bohemia" in Broadstairs, where they eventually meet Harry who has been working solo on the sands at Margate; he rejoins the team, and one again they have "Nothing to Lose"!